the Oxtongue River in the provincial park. Today we left Algonquin Provincial Park. Although the weather was fine at first we ended up driving to our next destination mostly in the rain. We packed up the camper and dislodged the cache of pine cones under the wheel well and on top of the tyres of the truck which some generous squirrel had stashed. It's funny, we were watching everyday as this busy squirrel was dashing between the trees and our neighbour's camper filling up the engine bay and wheel wells with pines cones. Of course before they left we warned them of the bounty they were carrying. I found it quite entertaining to watch - and now it was our turn to remove the pine cones! 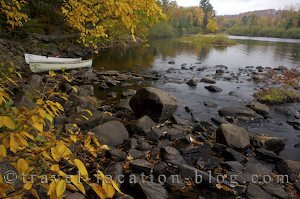 We drove out of Algonquin, but before leaving the area completely, we hiked along the Oxtongue River-Ragged Falls Provincal Park trail to check out the Ragged Falls. The trail was just beautiful - especially during fall with the river framed by the forest and large boulders. The waterfall was also impressive but we spent the majority of our time on the banks of the river photographing a couple of canoes and single fall leaves. When the rain came that was our cue to leave so we drove out towards Restoule Provincial Park - more a waypoint along the way towards our final destination - the Great Lakes district tomorrow. We stopped at Huntsville briefly between showers to photograph its interesting waterfront then moved on towards Restoule.